The CardioLog team is ready for another exciting SharePoint conference this spring. The team will be attending SharePoint Fest D.C, from April 27th to 29th in Washington D.C. The event will offer various workshops and classes created for SharePoint and Office 365 administrators, information architects, knowledge workers, power users, software developers, business and analysts and business leadership. 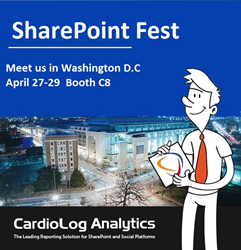 The CardioLog team will be featured in the "SharePoint Village", allowing conference attendees to explore the world of various 3rd party products and services throughout the SharePoint and Office 365 ecosystem. You can connect with the team and see a demonstration of SharePoint analytics at booth C8. The team will be demonstrating the new version of CardioLog Analytics, including an enhanced user face with a flexible reporting dashboard, enhanced table widgets, new reports, and variety of new features for both end-users and administrators. Intlock, developer of CardioLog Analytics, has been a leader in the field of analytics for SharePoint, Office 365 and Social Platforms for over 10 years. Their product - CardioLog Analytics - provides web-analytics and online marketing solutions for SMB and enterprise-level intranet portals and websites. CardioLog Analytics, delivers deep insights into the performance of portal, web and social platform initiatives through testing, tracking and targeting, ultimately enabling organizations to optimize their portal’s impact, maximize ROI, reducing operational costs and improving employee productivity. The solution is available for both On-Premises and SaaS deployments. Intlock is led by a team of experts and its products and solutions are installed in organizations from various industries, including financial services, government, telecommunication, entertainment services and others. Their customers range from Fortune 500 corporations to midsize companies, such as FedEx. Nike, Fidelity, Orange and others, who have chosen CardioLog Analytics to monitor and analyze their portal for issues pertaining to page views, navigation, search, growth, visitors and much more.